Life Is Art is proud to announce a solo show for Artistic Director R. E. SANCHEZ at the CS Gallery in North Miami. CS Gallery hours are Tuesday-Thursday: 10-4 pm. Last Fridays of the month: 7-11 pm as part of NoMi Art walk. CS Gallery is located directly across the street form the Museum of Contemporary Art (MoCa) in North Miami (NoMi). NoMi Art Walk: Enjoy live music at Jazz at MoCa and multiple exhibits at Art Nexus Gallery, Xinqo Art Studio, Caridi Gallery and Mario Flores Gallery. 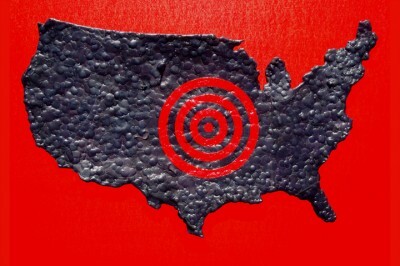 CS Gallery is proud to announce the opening of “STABBING HATE,” their new SOLO exhibition by visual artist R. E. SANCHEZ. This exhibition focuses on two series of work created between 2005 and 2007. The first series titled Stabbed In The Back: “Has Never Been In Love” Series details works created on paper and mixed media based on ideas of first introductions, loss of love, faÃ§ades, the unknown and the presented vs. reality. These artworks in many aspects are very general statements about contemporary society. The second series titled Terrorism Is A Friendly Reminder Of How Much We All Love Each Other: is created using the maps of some of the countries that have been victims of contemporary terrorist attacks. Black wax and blood red acrylic are very significant for they represent chaos, turmoil and the bloodshed caused by these attacks. These works call to question the ability of humans to interact and understand each other on multiple levels. Most recently his work has been exhibited as part of juried shows which have included The Hibiscus 1st Juried Art Exhibition at The Lighthouse Center for the Arts in Tequesta Florida, 20 x 20 x 20 A National Compact Competition at Louisiana State University’s Union Art Gallery in Baton Rouge Louisiana, The Blanche Ames National Juried Exhibition at The Ames Mansion at Borderland State Park in North Easton Massachusetts and Field of Vision: Beijing at the Beijing New Art Projects in Beijing China. His work can be found in many private collections.